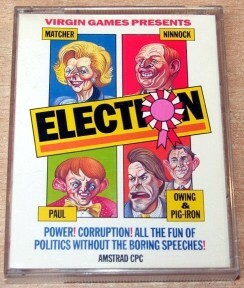 You can take the role of one of the five party leaders: Matcher, Ninnock, Owing, Pig-iron or Daniel Pauls (the leader of the Idealist party composed of celebrities). 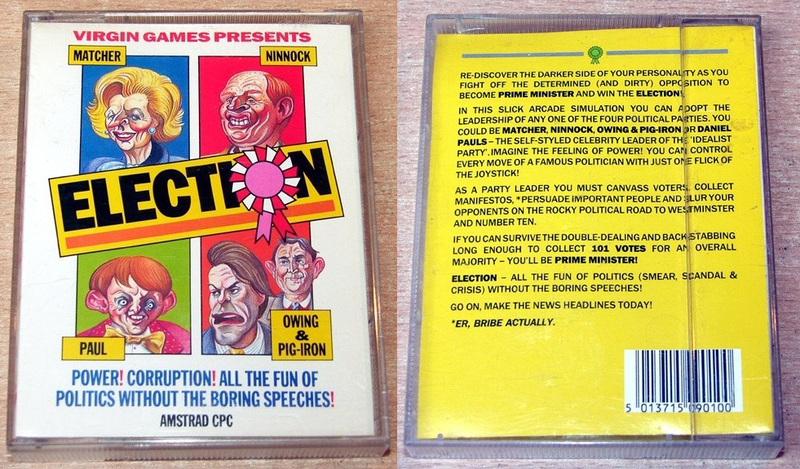 The task of each is to get 101 votes by a mixture of dodgy dealings. There are 40 characters in the game and many other votes that can be gained at named locations. Some characters start off with party allegiances and can help you in your task to win others over. The main method of getting votes is dropping manifestos in named locations, each location gaining you ten votes. As you race around the 108 locations you can access a menu of options. You can take, drop, give, ask, order, pause, canvass or slur. Take, drop and give refer to objects: ask, order, canvass and slur refer to people. Objects in the game can be given to people as incentives or to increase your slurring power. Some objects enhance your credibility rating (resistance to slurring) or the financial incentives (bribes) you can give. You can ask characters what they think of you or try ordering them to help you. If they aren't co-operative you can try to canvass them to win them over to your side, or resort to slurring them to reduce their credibility to zero and putting them out of action for a while. The game is entertaining with funny touches and an interesting task. I found it difficult to get anywhere because it's extremely difficult to build support, not helped by occasional crashes. I think the path to victory needed to be better thought out but otherwise if s an enjoyable game.